DuFour already has successfully logged more than 50 hours on their electric airplane, the aEro1. Now, it is turning to Flying cars. Since 2015, DuFour has had the vision of an eVTOl and developed a fully capable electric airplane to flight-test many of the electric components. It’s aEro1 is capable of flying for up to one hour, multiple times per day. Damian Hischier is a certified test pilot and holds an Airline Transport Pilot License with a Category 1 Flight Test Rating from the EASA. He flew more than 130 different aircraft types ranging from gliders up to airliners including 15 first flights of prototypes. He was also the test pilot for Solarstratos. 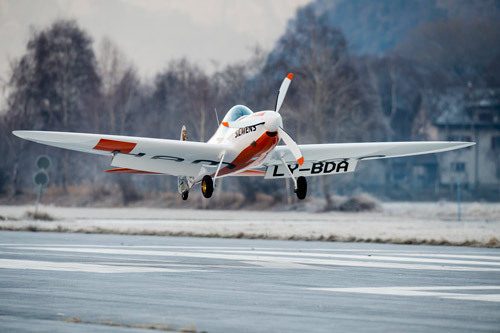 Damian is one of the few civilian pilots trained to conduct new aircraft testing, which makes him invaluable to flying car companies like DuFour. Hischier is from DuFour’s home in Switzerland. DuFour plans on using it’s eVTOL, the aEro2 to revolutionize rural transport in the Swiss Alps area. Visitors to the alps often stay in Zermatt, a small town near the mountains. They often have to travel three hours to get to Zermatt from Milan or Zurich by car. The trip by a flying car like the aEro2 would take between 22 and 30 minutes. DuFour plans to have a fully working prototype for testing by the end of 2020. Learn more about the aEro2 here. Prior to joining DuFour last week, Hischier had been a test pilot, project manager, and pilot for over twenty years at four different aerospace companies. At DaFour, he will be serving as Chief Test Pilot and head of Certification. Hischier received his bachelor’s degree in software engineering and economics in 1993 from Fachhochschule Luzern. Why it’s important: As the flying car industry develops, a demand for test pilots will flourish. Many companies are about to arrive at their prototyping stages and will need test pilots like Damian. It is important for everyone interested in the industry to understand who these test pilots are, where they can be found, and what certifications they must have to verify new aircraft.